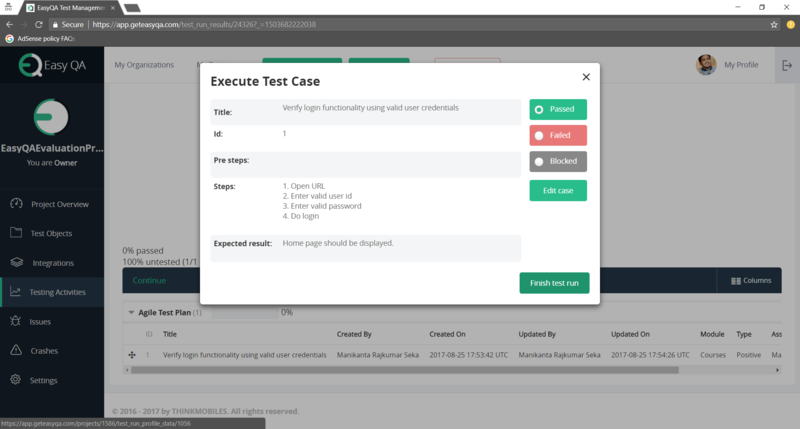 Last week I have shared TestLodge Test Management Tool Tutorial and today I would like to share EasyQA Test Management Tool. I felt that it’s very easy to use this tool. Even novice users could understand this EasyQA test management tool without putting lot of efforts. I would like to share this basic tutorial with all my readers. We all know how important is to use a tool to manage our Test artifacts such as Test Plan, Test Scenarios, Test Cases, Bug Reports etc., In this post, I will present some of the features of EasyQA such as Planning tests, Running tests, Test reports, Bug Trackers, How we manage the project and How we track activity using EasyQA. EasyQA Software Development Kit allows to catch crashes, if they appear in Android or iOS mobile applications. This we will see in another post. EasyQA is a test management tool. Using this test management tool, you and your team could plan all stages right from test plan to reporting without putting a lot of effort. It provides an easy to use google chrome extension which allows you to create and send a detailed bug report with in no time. You will get 30 days free trial to get hands-on to evaluate it. Best thing from EasyQA is you could evaluate all the features without any restriction in the trial period. You could purchase any of the cloud or standalone version. Let’s get started with Easy QA Tool. You could create Unlimited Organizations and Project (Projects creation will come in the later steps). Once you have created an Organization, you could invite members to the Organization. Members will receive an email. Once they approve then they could become a part of the project. You could add projects and assign members to the projects with specific roles. Note: I have added a member in the project. Below screenshot is captured from that members account. You could assign roles to the members in the project. Let’s create Test Objects and then we could create Test Plan and Test Cases. Once you are done, you could send the link to members by email. Add Test Cases: Click on ‘Add Case’ to add Test cases. Upload ‘CSV’ file where you have stored test cases and click on Next to import test cases. Graphical reports of EasyQA Test Management Tool looks like below. You could also generate reports in PDF format. EasyQA provides agile board and in the agile board you could easily identify the status of each issue. You could also drag and drop the issues from one column to another. This is all about this Test Management Tool. It’s your turn now to try EasyQA Test Management Tool. Share you thoughts in the comments below about this tool.